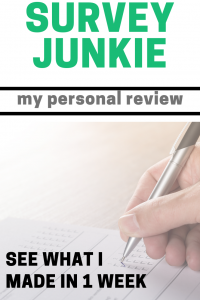 Quick Review: In short, I HIGHLY RECOMMEND Survey Junkie, giving it a 9/10 score. You can sign up here to start earning bonuses right away. Almost any survey list I land on, I always see Survey Junkie mentioned, and seeing I wasn’t a member of their panel just yet, I figured I would give it a try and see what the hype was all about. And if this is the first review you have read here, I just want to let you know I share my honest thoughts, regardless of what kind of relationship I have with the company. I really want people to make a few extra bucks with LEGIT companies. 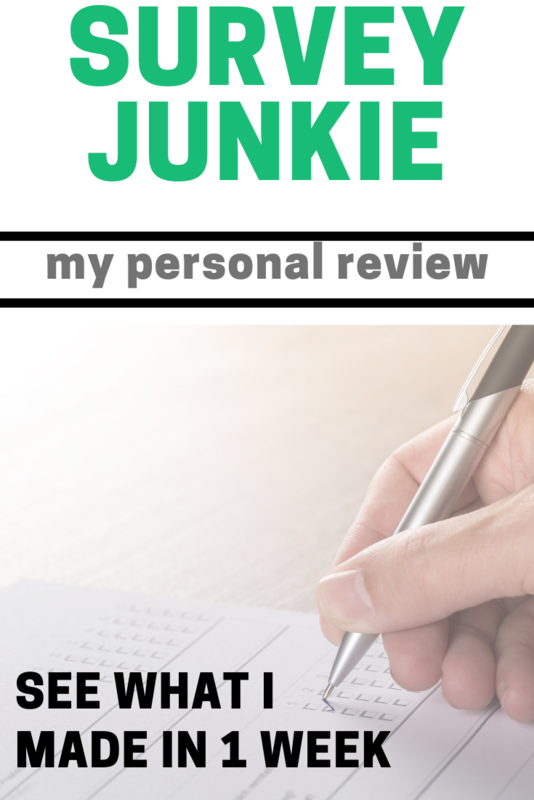 So if you’re thinking about joining Survey Junkie, hopefully, this review will help you decide if it’s worth joining! Before I even start with the review, let me quickly explain what Survey Junkie is. In short, Survey Junkie, operated by a company called Blue Media Ventures, has been in business since 2013 and is known as an online marketing research company. To date, they have more than 7 MILLION members and a B+ BBB rating. And the company, much like the many other research companies online, needs people like you and me to help answer questions and give feedback on products to help big-name brands improve. 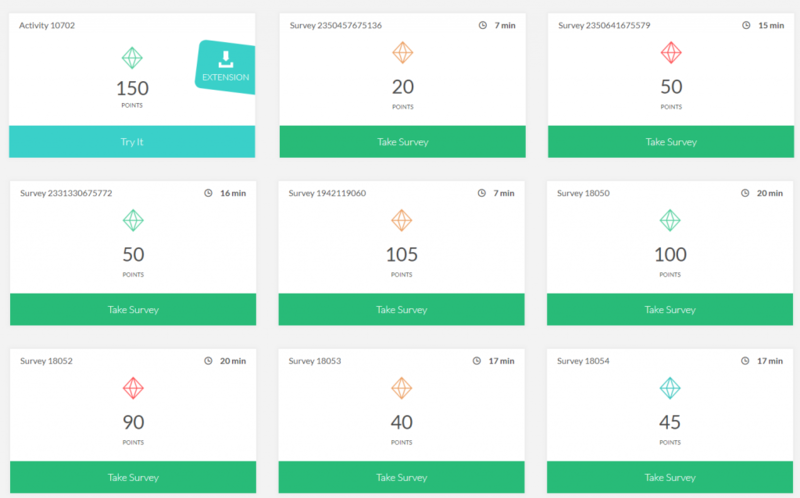 In exchange for your opinion, Survey Junkie will reward you for your time. It’s 100% FREE to join and they will never ever ask for a credit card or sensitive personal information (unless you make $600+ for tax purposes). For those questioning, yes, it’s 100% safe, it’s 100% legit and it’s 100% scam free, so there’s nothing to worry about here. Survey Junkie – Scam or 100% Legit? Right away, landing on the official Survey Junkie home page, it looks professional, clean and nicely displays what you can do if you do decide to join. 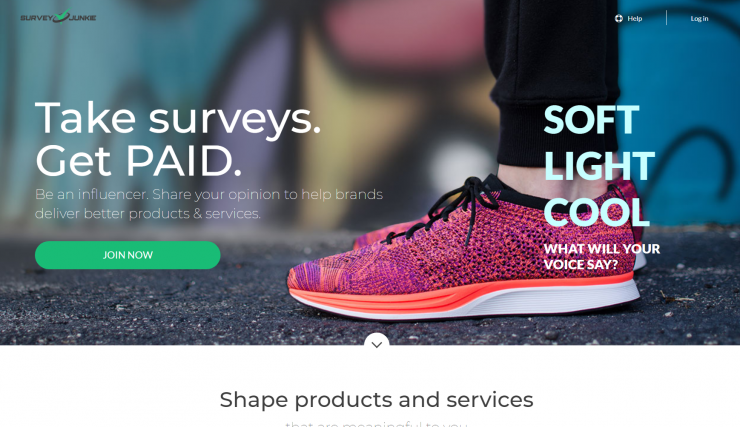 According to the main website, Survey Junkie, yes, as the name implies, will send you surveys, where you can help share your opinion, essentially helping brands deliver better products and services. In return, they will reward you with virtual points, in which you can cash out at a later time for either cash via PayPal or even e-Giftcards. I will get into this later, but for now, know that every point equals a penny. So if you’re looking for a company that focuses on surveys only and nothing else, then this could be one to highly consider. 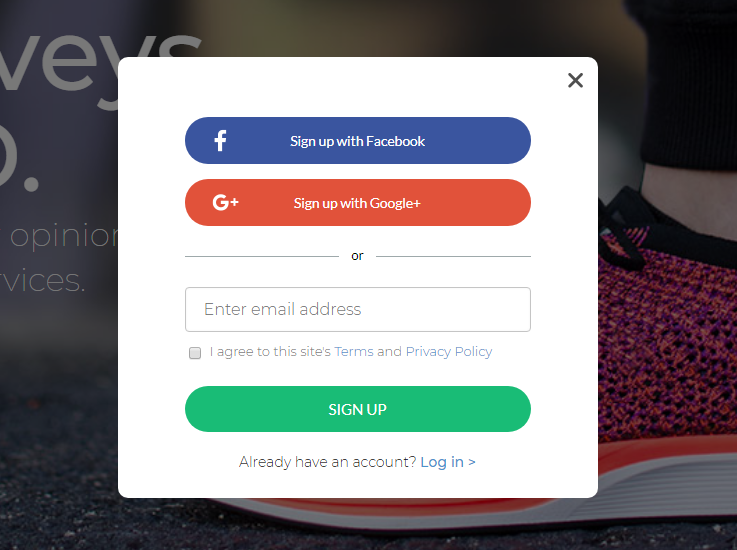 To sign up, Survey Junkie will first ask you for your e-mail address, followed by asking you a five-part questionnaire, most of which ask you for your zip code, date of birth, gender as well as a user name and password. You will see this simple questionnaire after clicking the signup button, as seen below. But before you do so, Survey Junkie asks that you’re at least 13 years old and reside in the United States, Canada or Australia. All in all, it took me less than one minute to complete it, and in doing so, it will take you directly to your dashboard, prompting you with a “QuickStart Checklist” that tells you what you need to do. 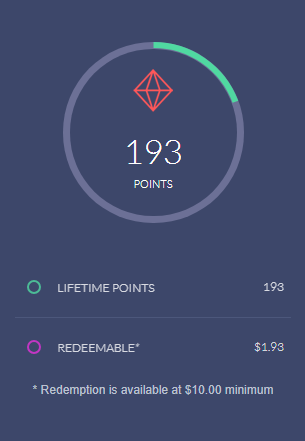 But the cool part, at least to me, was that Survey Junkie rewarded me with 25 points just for signing up and another 25 points for confirming my email and yet another 50+ points for completing my profile. This was an easy 75+ points right off the bat — $0.75 in value. And as you can see, it’s so simplistic. So much so that I would have to say that out of all the survey companies I’m part of, it was one of the EASIEST dashboards to work with. I liked it a lot. Unlike a lot of reward websites I talk about, a lot of them have other ways to make money, such as watching videos, surfing the web, playing the games and so forth. This can often clutter your dashboard and sometimes be confusing. And while there’s nothing wrong with these websites offering other ways to make money, you’re going to find that almost always, your money will be in the surveys as these often pay the most. Now, once you log in, you will have to confirm your email, see how Survey Junkie works via the checklist link and complete your profile for your easy bonus points. Failing to do so won’t let you view the active surveys as of right now, kind of making the website worthless, so, you will need to do this to go on basically. As for the “complete profile” link, all survey companies will want to know more about you so that they can send you targeted surveys that you qualify for. Just remember that even though you see surveys on your dashboard, it doesn’t mean you’re going to qualify for all of them. For me, the “complete” profile portion was broken down into 16 sections and took me about five minutes to complete. I was asked questions such as the pets I own, where I live, my marital status and so forth. It did appear, however, that the questionnaire could add more questions based on your answers, so it could be longer for some. Again, this is pretty common at any survey company you sign up for and needs to be done to maximize your survey opportunities. The thing I did like about Survey Junkie was that they make this process short and sweet. Not only that, they credited your account for it. To me, this makes me feel as if they are actually listening to their survey takers, something many of these research companies doesn’t do. I can respect that. All in all, I was able to sign up, confirm my email and complete my profile in less than 10 minutes, something that is almost unheard of in the survey world. 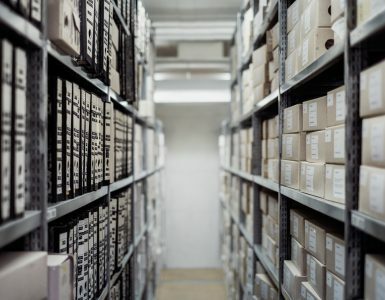 With a lot of companies I worked with in the past, some websites either made this profile process tedious and long, while others had profiles that seemed to last forever. Plus, a good chunk of them DON’T pay you for this time. You’re not going to see that here. 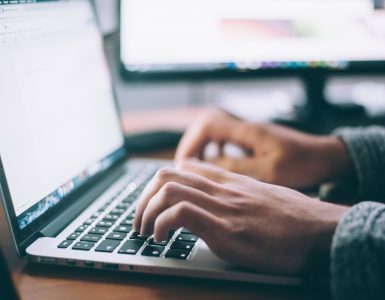 While Survey Junkie wants you to complete your basic profile, be sure to pay attention to your toolbar as they will add additional profiles that can help you earn high paying surveys. 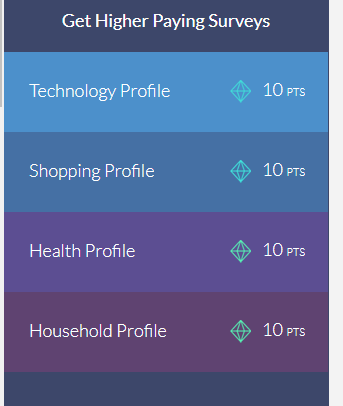 For example, when I attempted a survey and finished my checklist, I could then fill out a technology, shopping, health and household profile for an additional 10 points each. Now, while they are 100% optional, I do advise that you fill out your profile as much as you can since it will lead to more surveys. 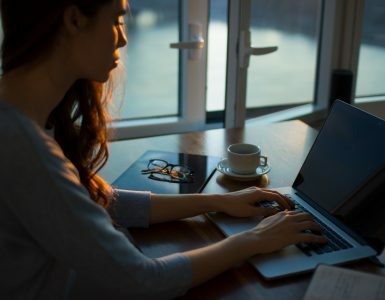 Remember, these research companies are looking for specific people, so if they know more about you, this can GREATLY increase your chances at snagging some good earning opportunities. As for those profiles, much like the original profile, plan on dedicating about 5 to 10 minutes to each. Once you confirm your email, take a small tour and complete your profile, you will finally be able to view all of the surveys you can take, most of which are based on your personal profile. For some, you could see more than 10 to 20 surveys at first, while others may see more or less. Like most survey websites, this will depend on your profile. I can’t stress that enough. Now remember, just because the surveys are on the dashboard, it DOESN’T mean you will qualify and receive the credit. In fact, I would say I disqualified for more than half of the surveys seen in the screenshot above. 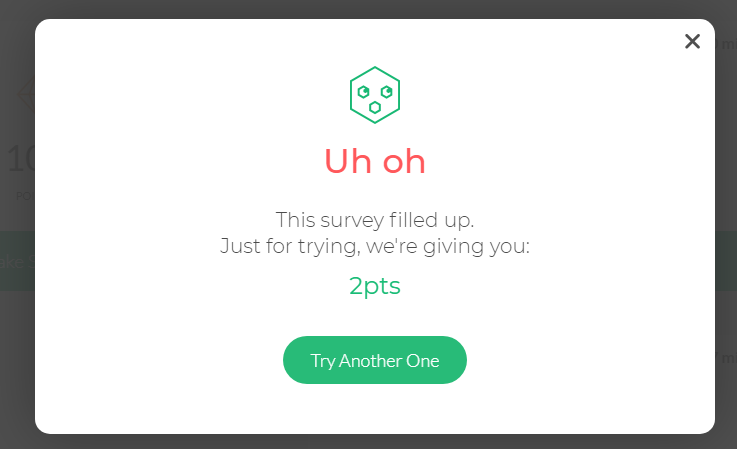 You will always have to qualify for the survey to receive the full amount, but the thing I did like about Survey Junkie was that they would give you points, usually about two points or so if you didn’t qualify. I know it’s not much, but hey, it’s better than nothing! Glancing at the dashboard, most surveys appeared to pay anywhere from 20 to 500 points, on average, with one point equal to $0.01. In RARE circumstances, I have seen reports of people getting more than $25+ for a survey, but again, this won’t happen often. Remember, you still get credits, even if you don’t qualify. As with most survey websites, these prices will change all of the time, so use it only as an estimate since it will greatly be based on your personal profile. Doing surveys for years now, you will find some surveys to be extremely frustrating as they are not worth the value, while once in a while, you will find some surveys that are short and sweet. This is going to be the case with all survey companies. 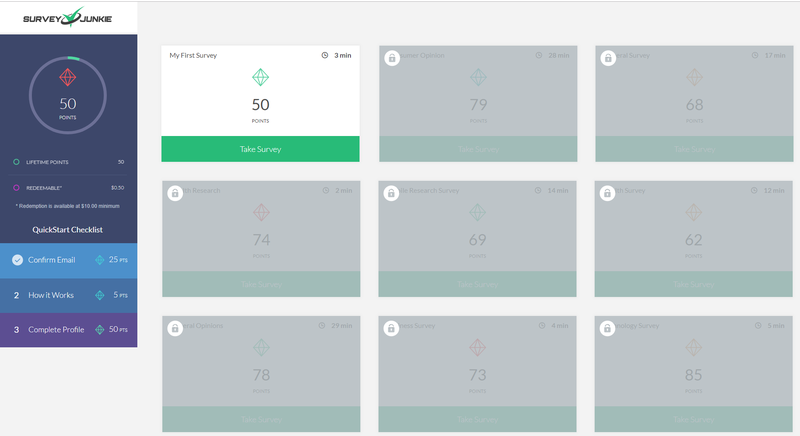 Before you even take a survey, the dashboard will tell you exactly how many minutes it should take as well as how much you will be rewarded. For most surveys, however, plan on investing at least 3 to 15+ minutes each, with the longer surveys compensating you the most. Most surveys will be no longer than 25 minutes, though. How often do you get surveys? I’ve been a member for a while now and I usually will get an email invite at least once a day, with survey opportunities ranging anywhere from as little as one to more than 10. Again, this will be based on your profile, so if you’re in a heavily targeted demographic, you could receive a lot more than someone whose demographic isn’t in demand. I recommend you log into your dashboard as it seems to constantly change throughout the day, with new surveys being added all the time. And being honest, I would say out of all the survey companies I’m part of, Survey Junkie probably offered some of the most opportunities by far. This GREATLY depends on how often you log in. But let’s say you log in every day and attempt to take every survey. If this were the case, you could maybe average $1 to $2+ per day, with an average of $60 per month or even more, again, if your demographic was in demand. One Reddit user, however, earned $248 in a month! Remember, surveys WON’T make you rich and are only meant for a little side cash. For the average person, however, I would say $25~ a month if I had to estimate based on my research. Payout Rewards – How Do I Get Paid? I know, you’re signing up for survey websites for one reason — to make some cash. And with Survey Junkie, the process is incredibly easy. Earn 1,000 points and you can then cash out, either via PayPal, a direct bank deposit or with one of many popular e-Giftcards. e-Giftcards and direct deposit methods, however, are only open to United States residents only. As I mentioned, every point is worth $0.01, so doing the math, 1,000 points, of course, equals $10. Once you hit 1,000 points, you can then either redeem your points OR wait until you hit a balance of your choice. The choice is yours. My opinion isn’t the only one that matters, so to make it easier for you, I scoured the web and broke down the things people liked as well as what people didn’t like. And what I find with many survey companies is that most of them always get a 2 or 3-star review out of 5 on review websites, often due to unique personal experiences, mostly because of people trying to break the rules and/or expecting too much in terms of payments. As long as you know you won’t get rich and you play by the rules, then it’s not too hard to earn $10, $20 or even $50 per month and not get banned when it comes time to cash out. Pay close attention to the duration. If it’s only 25 points for 25 minutes of your time, are you willing to make $0.50 an hour? Probably not. Look at the duration first and make sure it’s worth it. Make sure you fill out all of your profiles. The more the company knows about you, the more surveys you can get. Don’t worry about the e-mails; instead, log into your dashboard as I found multiple surveys that didn’t show up in my e-mail. Don’t be afraid to log in multiple times a day, either. If you see a survey you like right now, DO IT. The good ones fill up fast, and I mean fast. Surveys can be addicting, but try to set a goal. How much do you want to make? That way, you’re not aimlessly clicking throughout the day wasting your time. There are HUNDREDS of survey websites out there, some good, some bad, but I can safely say Survey Junkie is one of my favorites for a few reasons. For one, I LOVE the simplicity. The website just focuses on surveys and lays them out in a nice manner. If you’re looking for surveys and that’s it, this is one of the best. Secondly, I love the number of surveys I get. Sure, some surveys are annoying to fill out, but for me, I was able to hit the $10 threshold in as little as 3 days, making it one of the quickest websites I have signed up to date. And lastly, I like that the company rewards me if I don’t qualify and offers a cash option, not forcing me to take a gift card I don’t want. 9/10In the end, I give Survey Junkie a solid 9/10 and only knock it down one point because some surveys were so ridiculous for the payout. I know this is out of their control sometimes, but I feel they should ask for our feedback after every survey so that they can weed out the garbage offers. That was my only problem with it. If you haven’t signed up, be sure to do so and fill out your profile in depth. There’s no reason you can’t earn a few dollars in the next hour or so, especially with the bonuses and even more in the future. If you’re already part of the Survey Junkie community, share your thoughts below, both good and bad, to help our community succeed!